The Kampong is a tropical botanical garden located on the Biscayne Bay in Coconut Grove. This hidden gem of natural beauty showcases a wide variety of tropical plants and fruits. Here you will find fruits with exotic names like peanut butter fruit, candle fruits, egg fruits and so on. There are also varieties of pomelo, avocados and numerous types of mangoes. The garden is a major research and educational site for horticulturists. The serene environment is worth a visit, a tropical paradise in the heart of the city. Self- guided tours are available by phone or email appointment only, online sales not available. Please carry comfortable walking shoes, mosquito repellent, hat for shade and bottled water. Reservations are required in advance as there are limited spaces available for admission into the park. You can purchase admission online or by phone. Online reservations close approximately 48 hours before day of tour. How popular is The Kampong? People normally also visit HistoryMiami while planning their trip to The Kampong. 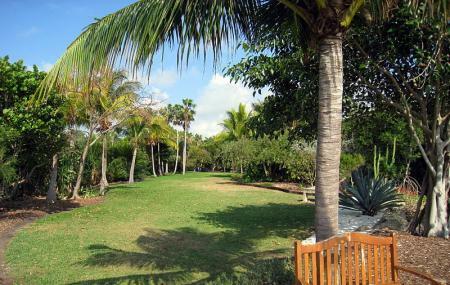 One of most beautiful hidden gardens of southern Florida located in a secluded yet central neighborhood. The hidden entry leads to a spectacular waterfront view. The open airy Southeast Asia style home is a innovative design way ahead of it's time. The plant collection is both continuously in flower and scientifically significant. The Foundation offers inspiration yoga classes. Entry is strictly limited but to visit ensures memories that will last a lifetime. I went there for a wedding in March and that was the best wedding I attended. There was a sweet fragrance of blossoms, the walk through the tropical plants was not too long, just right for folks who love nature but are dressed up. You can even walk to the ocean front! What a surprise!! I love the place, beautiful and peaceful. Well maintained, good customer service, and most of the area is clean. Accessible location, no problem with the parking lot, and memorable experience. This botanical garden is beautiful and peaceful. You'll need to set an appointment before your visit. Once you're there just enjoy this well maintained gem. Recommend to reserve a private tour ahead of time before your visit. Worth every minute to tour the Garden to learn Dr. David Fairchild's great works in Tropical plants and to enjoy this piece of oasis. Better wear hat, comfortable shoes and clothes to visit.